The men’s and women’s individual Finals on the fourth day of the FISU 2018 World University Squash Championship produced a magnificent double for the host country. Victories for Josh Masters and Lily Taylor in their respective competitions at the University of Birmingham were not only a cause for celebration for the United Kingdom on home territory, but also by the University of the West of England where they both study. Masters recovered from a game down to overcome the men’s top seed Yip Tsz Fung 3-1 (8-11, 11-8, 11-2, 11-5), while Taylor avoided the fate of two other top-six-seeded women by seeing off the South African Alexa Pienaar in straight games (11-7, 11-8, 11-6). With neither reigning champion Yip nor second seed Masters having dropped a game throughout the tournament, something had to give - although with 28 World Ranking places between Yip (25th) and Masters (53rd), the pre-Final odds were stacked in favour of the 24-year-old Management Sciences student from the City University of Hong Kong. Their first game, indeed, went that way - with Yip prevailing 11-8 after an 11-minute tussle that culminated in a stroke for the 2016 gold medallist. But the six feet four inches Masters used his height and reach to great effect before prevailing in the second by the same score. And from that stage, the Mathematician, who at 21 two years earlier had been a beaten Semi-Finalist, truly executed his a-game - blitzing Yip 11-2 in the third, and then claiming a closer fourth, as well as the title, with a stroke that was upheld following video review. He added: ‘I’ve really enjoyed playing on this (glass-back) court all week as it suits my game, and I’m really, really happy with the result. Masters’ fellow UWE student Taylor, who reads Business with Accounting & Finance, had become the sole British hope in the women’s event after the Quarter-Final stage, which had seen her top-seeded compatriot Grace Gear knocked out in straight games by eighth seed Pienaar. The 24-year-old Johannesburg University student subsequently reached the Final after seeing off in the last four another higher-ranked opponent, Zoe Foo, seeded six. But there was to be no hat-trick of such upsets, as third seed Taylor - three years Pienaar’s junior - started strongly in each of their three games, and proceeded for the most part to stay in front before clinching gold. ‘I’m absolutely thrilled,’ enthused Lily afterwards. ‘I can’t believe it really as I was just focusing on the match, it’s pretty special. He added: ‘They were both very tough contests as we headed into them. Lily got us off with a bang, she got the game-plan spot on and executed well against a strong opponent under pressure. ‘Josh on paper had a mountain to climb, with 28 places between them in the rankings. His first game started slowly, and he then delivered a fantastic performance from there on in! 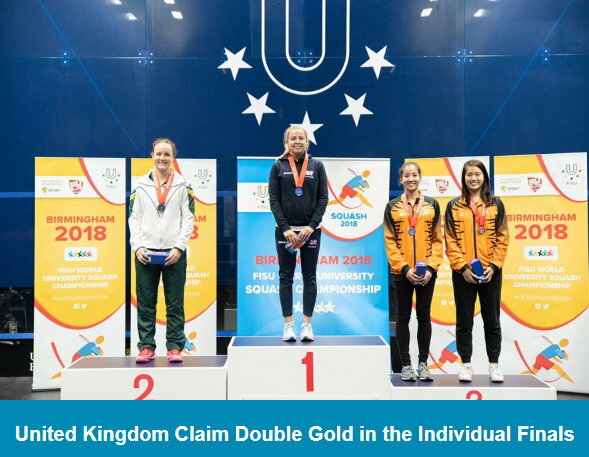 The FISU 2018 World University Squash Championship staged, on its third day at the University of Birmingham, the Semi-Finals of the men’s and women’s individual competitions. Those two are home candidate and third seed, Lily Taylor and Alexa Pienaar (8), South African conqueror at the Quarter-Final stage of the UK’s other original hope, Grace Gear (1) - who, incidentally, and as part of her consolation quest to secure fifth place, blew away Shehana Vithana (4) from Australia for the total loss of a paltry six points inside 16 brutal minutes. But let us return our eyes to the main prize - for which Pienaar was first on court yesterday, and Malaysia’s Zoe Foo (6) stood in the way. A combination of well-executed drops and volleys secured the first game for the Art Design & Architecture student from Johannesburg University, who, despite then conceding the second, recovered her consistency in the next two to prevail 3-1 (11-7, 7-11, 11-5, 11-6). Taylor also faced a Malaysian opponent - albeit a higher-seeded one in Aika Azman (2). Not that this initially appeared to faze the home player, whose dominance in the first game was such that she cruised through at the cost of just a single point, and who was similarly emphatic in winning the third with just two points dropped. Either side of the latter game, unforced errors cost her the second, while Asman secured the fourth with the tightest of drives - before a more cautious decider went the way of Taylor for victory by the odd game in five (11-1, 7-11, 11-2, 7-11, 11-8). “It was a very up and down match,” said Taylor afterwards. Taylor’s success in reaching her Final was matched by fellow student from the University of the West of England, Josh Masters (2), in the men’s event. Masters, a beaten Semi-Finalist in the last Championship two years previously in Kuala Lumpur, went at least one better on this occasion by seeing off the challenge of Mohd Syafiq Kamal (3) from Malaysia in straight games dominated by hard-driven rallies (11-3, 11-7, 13-11). “I’m very happy to get into the Final,” he said. And tough it will no doubt be - for Masters will need to overcome World No 25 and reigning Champion Yip Tsz Fung (1), from the City University of Hong Kong, if he is to claim the title. Yip, who, like Masters, has not dropped a game throughout the Championship, faced Addeen Idrakie (4) - the remaining representative of a Malaysian Semi-Final quartet across both individual competitions. In the event, Malaysia was to miss out on a Final berth of any description, as Idrakie, despite competing with passion and pace, was ultimately undone by the range of shots in the armoury of Yip, who once again prevailed 3-0 (11-4, 11-6, 11-9). The second day of the FISU 2018 World University Squash Championship saw the leading men and women have to negotiate two rounds in their individual competitions, with a view to determining who will contest the respective semi-finals at the University of Birmingham this afternoon. While the men’s tournament stuck to the seeding script, with its leading quartet making it through to the last four in relative comfort, the women’s event will be without two of the top four seeds in the semis. Most remarkably, those two include first seed and World No 91 Grace Gear, who, in the last quarter-final match to be staged yesterday, bowed out in straight games to Alexa Pienaar (8) from South Africa (6-11, 10-12, 11-13). The Cardiff Metropolitan University student had already been severely tested in her early-morning second round tie against the Austrian Jacqueline Peychär, who took Gear to five games before the top seed eventually prevailed (11-8, 11-3, 8-11, 10-12, 11-3). But, come the evening, Pienaar - having enjoyed a routine straight-games win earlier in the day - went on the attack against the top seed, with low, flat shots proving most effective against her UK opponent, whose participation was temporarily interrupted by treatment for an injury in the second game. A delighted Pienaar declared afterwards: “[it feels] a bit unreal at this moment… I’m so happy to have made it this far!” She will face in the last four Malaysian Zoe Foo (6), who also disposed of a higher seed, Shehana Vithana (4), in straight games (11-7, 11-7, 11-4). Vithana, like Gear, took to the court for her quarter-final after a grueling five-game tussle during the morning - which, in Vithana’s case, had involved overturning a two-game deficit before edging out her fellow Australian Jessica Osborne (9-11, 7-11, 11-8, 11-8, 12-10). The other women’s semi-final will involve the two highest-ranked remaining players - with Malaysia’s Aika Azman (2) having seen off both the unseeded Marija Shpakova and Ho Ka Wing (5) in straight games, and the now-sole home hope Lily Taylor (3) beating Maarit Ekholm 3-1, before prevailing 3-0 against another non-seed, Hayley Ward. South African Ward, on a good day for giant-killing by her countrywomen, had a few hours previously pulled off a five-game Second Round victory against seventh-seed New Zealander Eleanor Epke (11-8, 11-7, 9-11, 5-11, 13-11). The men’s semi-finals, rather more straightforwardly, will see Yip Tsz Fung (1) from Hong Kong take on Malaysian Addeen Idrakie (4), while the UK’s Josh Masters (2) is up against Idrakie’s compatriot Mohd Syafiq Kamal (3). All four enjoyed straight-games wins in the Second Round, before both Yip and Masters repeated the margin of victory in their respective Quarter-Finals against the Czech Jakub Solnický (13) (11-5, 11-3, 12-10) and Wong Chi Him (5) from Hong Kong (11-3, 11-4, 11-3). The two Semi-Fnalists from Malaysia, meanwhile, both needed four games to see off the challenges of their opponents in the last eight. Kamal defeated another Hong Kong representative, Henry Leung (7) (11-8, 6-11, 11-8, 11-7), and, in a fast-paced tussle, Idrakie put out his fellow countryman Sanjay Singh (6) (11-9, 14-12, 4-11, 11-5). 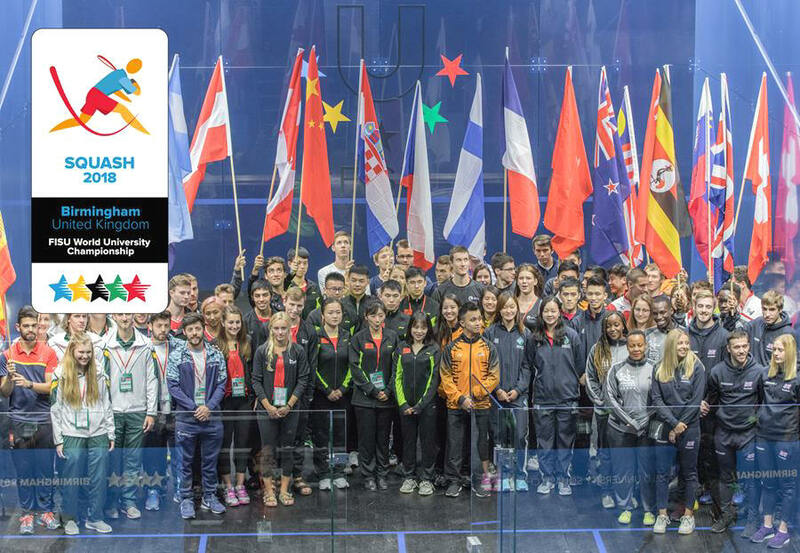 The FISU 2018 World University Squash Championship got under way yesterday with the early rounds of the men’s and women’s individual competitions. Surprises were at a relative premium in the initial 38 matches played at the University of Birmingham - although by the end of the day, two men’s seeds had each been edged out by the odd game in five to exit the Championship. Australia’s Thomas Calvert (seeded 8) and Swiss hope Robin Gadola (10) came unstuck against, respectively, Federico Cioffi from Argentina (11-7, 9-11, 13-11, 7-11, 9-11) and the South African Dewarld van Niekerk (11-4, 10-12, 12-14, 11-9, 10-12) - despite the first games of both Second Round matches going to form in favour of the seeds. Cioffi’s triumph was all the more remarkable, coming as it did only a few hours after he had been on court to face Sion James Wiggin of New Zealand in one of the Championship’s opening 10am First Round ties. The Argentinian did, however, make short work of Wiggin - prevailing in straight games over just 24 minutes to keep something in reserve for his later-afternoon mission. Argentina had a great chance of pulling off not just the one shock, but a hat-trick of them, as Cioffi’s unseeded compatriots Francisco and Rodrigo Obregón both took seeds to five games in the men’s Second Round, before falling in the fifth. Each of the twins detained his higher-ranked opponent for over an hour, before Henry Leung (7) of Hong Kong edged out the right-handed Francisco (11-5, 10-12, 11-9, 9-11, 11-6), and David Zeman (12) from the Czech Republic saw off the challenge of left-handed Rodrigo (8-11, 13-11, 8-11, 11-8, 11-5). Elsewhere in the men’s competition, a combination of 3-0 and 3-1 victories saw seeded players safely through to the Third Round - with the top five seeds all securing straight-games victories, and each of the leading two dispatching his opponent with 20 minutes on the clock. Hong Kong’s Yip Tsz Fung (1) gave a drop-shots masterclass in the course of defeating Singaporean Benedict Chan (11-4, 11-4, 11-5), while home player Josh Masters (2) comfortably beat the South African Adam Erni Shean (11-3, 11-3, 11-1). The women’s competition, unlike the men’s, confined itself to completing just the First Round on the opening day - and its eight matches did not involve any seeds, who join proceedings from this morning. Six of those eight contests were done and dusted inside half an hour - although very much less time was required in some cases. Canadian Hannah Blatt was on and off court in 10 minutes after defeating Esther Nakato of Uganda in straight games and without conceding a single point. And Marija Shpakova from Switzerland, having dropped one point in the first game against her Chinese opponent Xiao Yating, did not lose another in the process of an extraordinary eight-minute 3-0 rout. With accreditation complete, the draw for the individual championship was devised. Good luck to all the competitors. We will also be live streaming the semi-finals and finals of both the individual and team competitions - visit the YouTube channel to watch on Saturday 8 September 3.15pm (BST), Sunday 9 September 4pm (BST), Tuesday 11 September 4pm (BST) and Wednesday 12 September 4.30pm (BST).